Google Adwords Express is a simple tool that makes creating PPC ads easy for the inexperienced. But if you already know how to use Adwords, the limited version might be frustrating. Want to start using the full version of the platform? Switching from Adwords Express to Adwords is simple, but the process has changed in 2019. Take a look at our simple guide to switching, or skip ahead to the step-by-step video walkthrough. Adwords Express vs. Adwords: What’s the Difference? Why Does Google Want You to Use Adwords Express? Should You Keep Express or Switch to Adwords? First thing’s first: what is Adwords? If you haven’t yet begun using it, Adwords is a great tool to have at your disposal. It’s a platform that allows you to create pay-per-click (PPC) advertising. 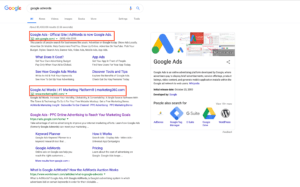 PPC advertising is a great way to get your message to people who may be interested in your business: it’s fast, targeted, and—best of all—you only pay when your ad gets clicked. Better yet, it can be incorporated into your Inbound Marketing Strategy. To make PPC advertising accessible to everyone, Google has actually created two different versions of their ad management system: Adwords Express and Adwords. Think simplicity. Setting up an Express campaign is fast and easy: just tell Google what your advertising goals are, create an ad, and set a budget. Google does all the rest. Based on your industry, Adwords will select relevant keywords to bid on. The rest is automatic: people search for those keywords and your ad has a chance to appear, putting your attention in front of relevant audiences with little to no effort on your part. Think full control. With this version, you have complete control over your ads. You can create campaigns and ad groups, target specific keywords, customize your ads, manage your campaigns with detailed analytics, and more. This is not a “set it and forget it” approach like Adwords Express; a full Adwords campaign requires more attention and work on your part. When you go to set up a campaign (or if you already have one), you might notice that Adwords Express is the default—and there’s no obvious way to switch to a full campaign. The simplest answer is that Adwords Express is the simplest product. PPC is becoming more and more popular, and the powers that be at Google are trying to make it easier for inexperienced users to start using their platform. Should I Keep Express or Switch to Adwords? Whether you keep the default or switch from Adwords Express to Adwords will depend on your business, your prospects, and your comfort level with the platform. If you’re new to PPC advertising or simply don’t have much time to invest in the process, the advanced settings and abilities of the full version might be overwhelming. In this case, the simplistic Adwords Express might be your best option. All you have to do is set up the campaign, and Google will take care of the rest. However, many businesses are familiar with PPC. If you know how to handle campaigns, keywords, targeting, and other PPC settings, you might feel frustrated and limited by the Express version. In that case, it’s time to switch from Adwords Express to Adwords. If you’re creating a new campaign, it’s very easy to switch—even if the solution isn’t immediately obvious. When you log in to Adwords, you’ll see a simple screen asking you what your advertising goals are. Don’t set a goal just yet! Choosing a goal launches an Express campaign. This will bring you to another page where you can begin setting up a complete Adwords campaign. Skip creating a campaign and click on “Create an Account without a campaign”. Make sure you have the appropriate info regarding billing country, time zone, and currency for your account. Once this is updated, press “Submit”. You’ll be greeted with a trophy for your work so far. Now press on “Explore Your Account”. And that’s it. It’s that easy! You can begin creating ads, targeting keywords, and managing your budget—what you do with the campaign is up to you. Looking to bring prospects to your website or your business’s front door with Adwords? Whether you’ve never written a PPC ad before or you’re an old pro, we can help manage your ads, ensure you’re targeting the right audience and keywords, and plan your keyword bids. Contact us to learn more about our Pay-Per-Click services.